Over the last year the city’s been watching as our iconic stadium, BC Place, has been getting a makeover. 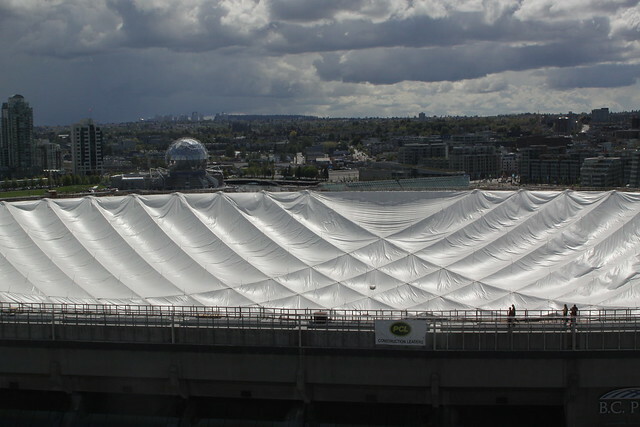 With marshmallow top deflated and a new retractable cloth roof being installed, it will change the way we watch live sport in Vancouver. Your chance to check out the renovated stadium will come July 31st as they host a free public open house of BC Place. In an online poll I conducted in January of this year, 55% of my readers said they were excited about the new look (while the other 45% weren’t). Visitors will be able to walk onto a section of the floor at BC Place as workers continue to install the retractable roof, seats, and other interior upgrades. 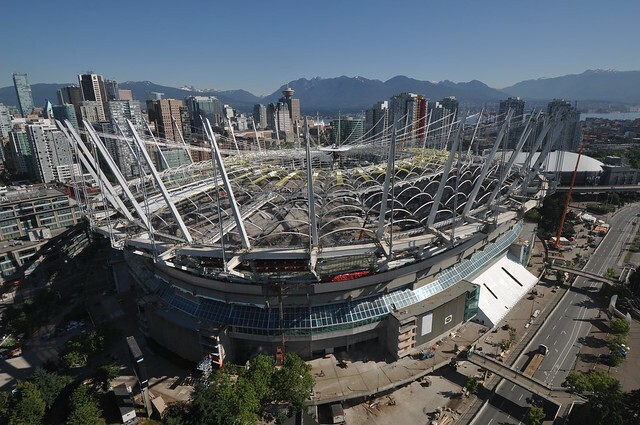 BC Place will also host the 2011 Grey Cup Festival and championship game in November. Could they not have had the open house a week later and not right in the middle of the pride parade? I’ll be taking my Dad there this Sunday. He was an ironworker for most of his life, and worked on the original BC Place roof. He was standing on top when it was first raised. He’s disabled now, due to a fall from a scaffolding, and is losing his memory, but he is still quite proud of his work on the dome. I’m so proud of him too. He’s excited to be on site again. Thanks for letting us know!!! People do not judge the new bc place until it is completly done, any constuction site does not look good until it is finished. the new bc plac is going to be a state of the art stadium the best in canada and in the top 10 in north america. I’d like the chance to take a sneak peek! It looks like a giant spider web right now and I bet it’s impressive from inside. I haven’t been in there since the 2010 Games, (it was my venue) so it would be cool to see the work in progress.